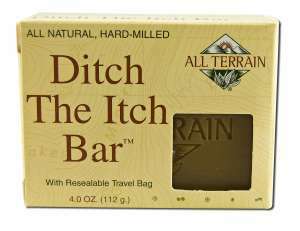 Natural, Hard-milled ALL TERRAIN Skin Relief Bar The Ultimate Soap for Easing Irritated Skin with Resealable Bag for Travel 4.0oz bar. A serious functional soap, Skin Relief Bar is especially formulated to naturally cleanse and ease irritated or itchy skin. Great for general skin discomforts, rashes, and itchiness, particularly from poison ivy, sumac or astringents and humectants help soothe the skin by tightening and maintaining moisture. Ingredients: Sodium Palmate, Sodium Palm Kernelate, Water, Glycerin, Malaleuca Alternifolia (tea tree) Leaf Oil, Melia Azadirachta Leaf Extract, Oat Extract (water, butylene glyco, aven sativa (oat) kernel extract, major leaf extract), Sodium Chloride, Plantain Extract, Tetrasodium EDTA, Iron Oxides.